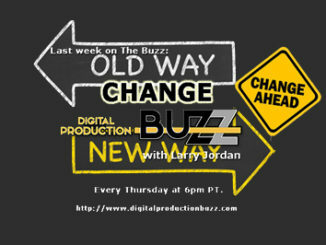 Every week I create multiple projects from each webinar that need to be exported. And, each week, I do this one at a time. Boring. 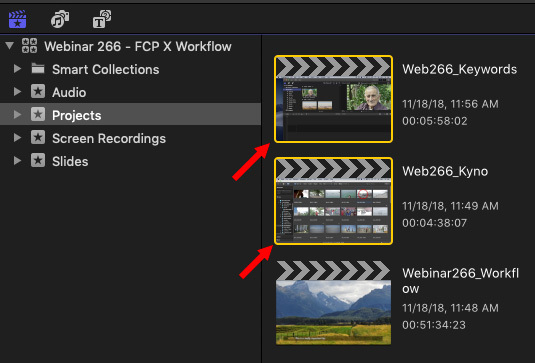 New with the 10.4.4 update to Final Cut Pro X, Apple delivered a feature that I’ve been hoping for since my first export: the ability to export multiple projects at the same time. Called Batch Export, here’s how it works. In the Browser, select all the projects or clips you want to export. 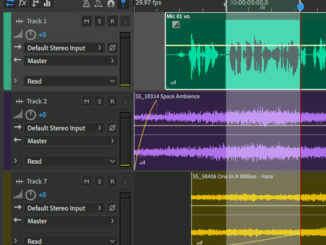 NOTE: You can’t mix projects and clips in a batch share. Your selection must contain only projects or only clips. Batch sharing is not available for all destinations. Choose File > Share and notice that the menu updates based upon the number of files you select to export. NOTE: I always export Master files so I have a high-quality version for archiving. 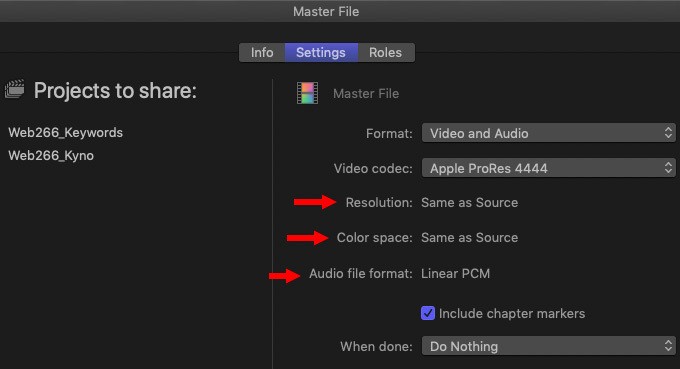 However, you can share multiple files to either a Master File, Compressor or any destination supported by Final Cut Pro. In Master File > Info, notice that the queue of projects is listed on the left. while, on the right, you can add common Creator or tag labels. The Master File > Settings screen also shows minor changes. Batch exports require using the same Format (Video, Audio or both) and Codec, however, the resolution, Color Space and Audio settings can vary by project. Master Files > Roles has the biggest change. You now need to specify which Roles are active in the Timeline Index for each project, rather than at export. This allows each project to use and enable different Roles. NOTE: It is interesting to note that this is exactly the opposite behavior to when Roles were first introduced. At that time, there was no relationship between Role settings in the project vs. export. I like the new version much better. As projects export, the Background Tasks window displays the status of each file. And, when exporting is done, the Notification bar displays updated information. 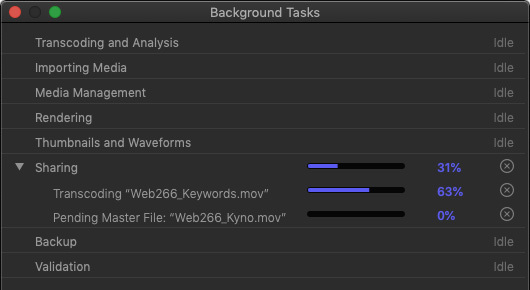 NOTE: Batch Export works best when all projects or clips have the same settings. 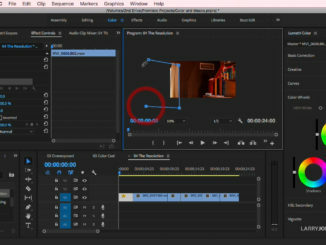 As you mix Roles, Captions, or Project Settings, your choices become more limited. Read Apple’s Help Files to learn more about the specifics. 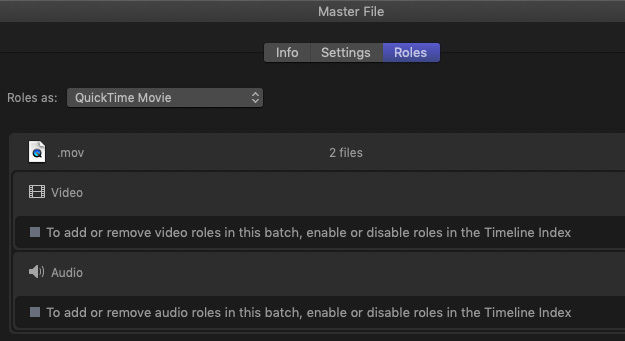 This is a welcome addition to Final Cut Pro. While the earlier system wasn’t bad, this is both faster and more intuitive.